The secluded hilltop estate in the Moon Mountain District is one of Sonoma’s best kept secrets and thrives with stunning terraced vineyards, sweeping views of Sonoma Valley, on-site boutique winemaking, state-of-the-art olive mill, bocce courts, culinary garden with fig and citrus trees and a spectacular underground cave where all of the private luxury wine tastings and food and wine pairings are conducted by appointment. Famed restauranteur of the iconic North Beach Restaurant in San Francisco, Lorenzo Petroni, founded this 37-acre estate atop a steep mountainside of the Mayacamas Mountain range in 1992 and was the first California vintner to grow the Tuscan clone “Sangiovese Grosso” in Sonoma soil. Known as Sangiovese Poggio alla Pietra (Hill of Rocks) today, the canes or vine clippings were originally flown in from Montalcino, Italy (along with 10,000 olive trees) and remains one of their most popular bottlings in the collection. 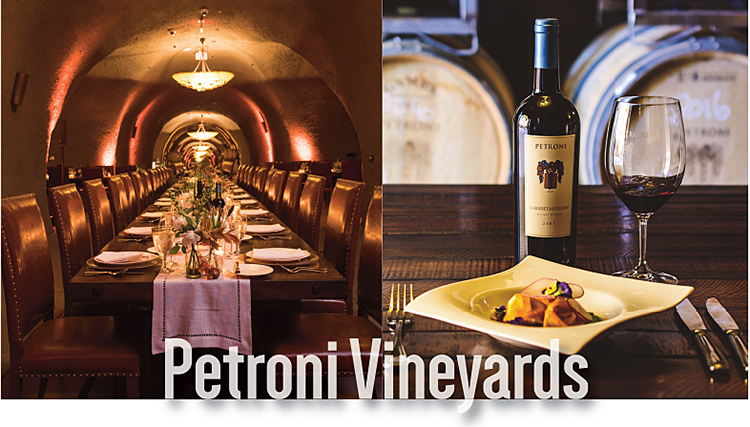 Petroni Vineyards has now broadened its repertoire of varietals to focus on micro-productions of Petit Verdot, Cabernet Franc, Syrah and mountain-style Cabernet Sauvignon garnering an impressive 13 scores of 90+ points in Parker’s Wine Advocate – five of which scored 93-95 points. Their wines are not distributed and are sold exclusively at the winery. Savor a 3-Course or 5-Course Food and Wine Pairing offered by appointment only. The seasonal small bites created by their in-house chef are fine dining caliber and incorporate produce from their garden along with meats and cheeses from neighboring ranches. Each luxe pairing is a full sensory exploration of Petroni Vineyard’s award-winning, hand-crafted wines and Sonoma’s agricultural bounty. • The first winery in California to produce a Brunello-style wine outside of Montalcino, Italy. Made from 100% Sangiovese Grosso clone. • Estate-grown Extra Virgin Olive Oil, milled on-site using Frantoio, Moraiolo, Coratina, Pendolino and Leccino varieties. • Add Charcuterie Tasting - $35/plate. Add a selection of local salumi and cheeses to your wine tasting. Request when booking your tasting reservation.